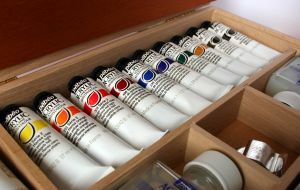 Technique of painting in oils is more difficult (from the point of view of technology) and more expensive use, for example, gouaches, watercolors or pastels. Different graphical tools can help the artist to realize different designs. Paintings in oil, have their own character set by texture, the colours, the technique and the skill of the author. 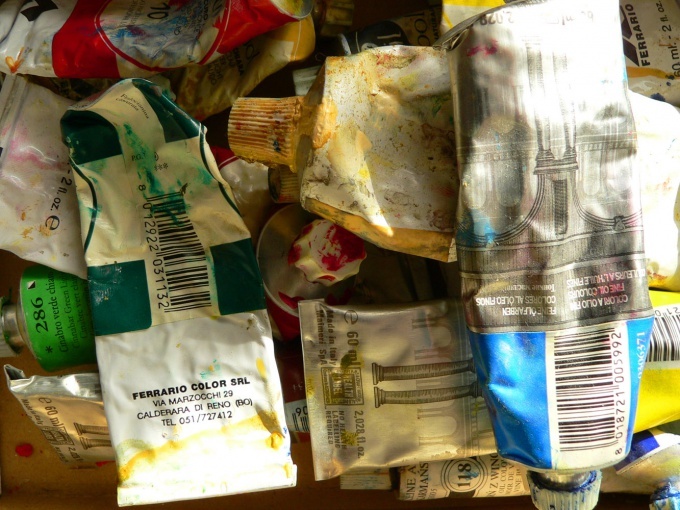 Oil paint, primer, glue, fixative, palette, brushes (preferably flat and made from natural materials), palette knife, easel, pencil, eraser, tracing paper , carbon paper and other useful things purchased by artists for ease of operation. Buy canvas. Usually they come in linen or cotton. Cotton canvas is cheaper and easier to handle. Linseed is fine-grained, suitable for creating fine detail, and coarse, which well reflect the texture (e.g., rocks, sea). Instead of the traditional canvas for oil used burlap, plywood, hardboard, metal. You can use paper, but the picture will not be different strength. Cheaper canvas – one that stretched on cardboard. It is thin and easy to carry, with a maximum size of 0,5x0,7m. Canvas on stretcher more expensive and heavy, but larger – up to 1,2x1,5m. Together with the canvas purchase all the necessary supplies: oil paints, primer, glue, fixative, palette, brushes, palette knife, easel. If you do a sketch on paper, and then translate it onto the canvas, you need a transparent paper is tracing paper and carbon paper. In the process, can be useful something else, so consult with the seller. Glue and cover the ground canvas, and then let it dry. This operation is done to ensure that paint did not destroy it well and lay down on the canvas. Make a sketch with a pencil. If writing technique is multi-layered, the picture you want to pin special tool, or cover with another layer of soil. Further everything will depend on the technique. If the picture is small, and the experience of creating the paintings is still small, try the technique in a single session (alla prima). This means that the picture should finish in one or a few approaches, but time before the paint dries. The time of drying of oil paint on average about 3 days, depending on the thickness of the layer. On the picture you'll get the tones and colors you create by mixing. Additional color will turn from shining through soil. The painting itself will be more easy and light. Usually artists use a layered technique: it reveals all the possibilities of oil painting. The gist of it is that the author divides his task into several subtasks, which are then implemented in different layers. First, you create the first thin layer called "underpainting". To run paint diluted. Underpainting helps to determine the composition, tonality, form, shadows and chiaroscuro. In subsequent layers the artist gives step by step details of form and color, texture. In the last layers added linseed oil to give richness and color stability. After the paint is dry it is varnished. The duration of this period depends on the thickness of the layers, and the average is 6-12 months. Learn about the laws of composition and colour mixing before you take up oil. Spend time with watercolor and gouache to get the hang of. According to the technique of oil closer to gouache – paintings become dense and opaque. An easier way to learn the art of drawing – courses in a group or individually by a skilled master. To have the trial in the oil painting do not buy expensive materials. Work in this technique requires the necessary training, skills and patience. Go from simple to complex. Drawing pencil on the ground should be applied gently to the ground not cracked. You can insure by applying another layer of primer. When using a layered technique remember that each layer thickness should be equal to the previous one or be more of it. Otherwise oil will crack. Before proceeding to the next layer, wait until dry previous. If you do not like the result, remove carefully the layer until it has dried, either apply another layer on top. They can draw on almost any surface, they will not melt from accidental contact with water, will not fade in the sun and will not crack. They combine the properties of watercolor and oil. In General, acrylic paint is simply a joy of the artist. Paint them nice and easy, if you know a few basic techniques. Prepare surface. To paint with acrylic on paper (thick is better, watercolor, for example), wood, glass, plastic and other materials. After drying, the paint will turn into a thin elastic film, resistant to water, light, mechanical stress. Depending on the core material, select an acrylic dye for smooth or porous surfaces. To experience with acrylic you will only set of the six colors. They are easy to mix, and when applying a new layer on the dried up previous shades will not mix and will not give the effect of dirt, as often happens with gouache. To create a translucent layer dilute the paint with water – you can do it in the palette or any convenient jar. Very diluted paint, apply with a soft brush: they better absorb and give up liquids. Try to put a few translucent layers of diluted acrylic paint (each time waiting for the previous layer is dry), you get an interesting effect soft "glow" of different colors through each other. For slightly diluted acrylic paint, use a synthetic nylon brush. For drawing undiluted acrylic take a hard synthetic brush, rectangular and wide, so you can quickly cover a rich dense color a large surface. The movement should be quite fast, because acrylic paint dries quickly. A thin layer dries in a couple of minutes, thick – 15-20. For accurate drawing of small details, take a kolinsky brush. If in the process of drawing you made a mistake or the hand tremble, do not worry. Damaged fragment can be covered with a new layer of thick acrylic and fix the problem. Using acrylic paints you can create different textures. 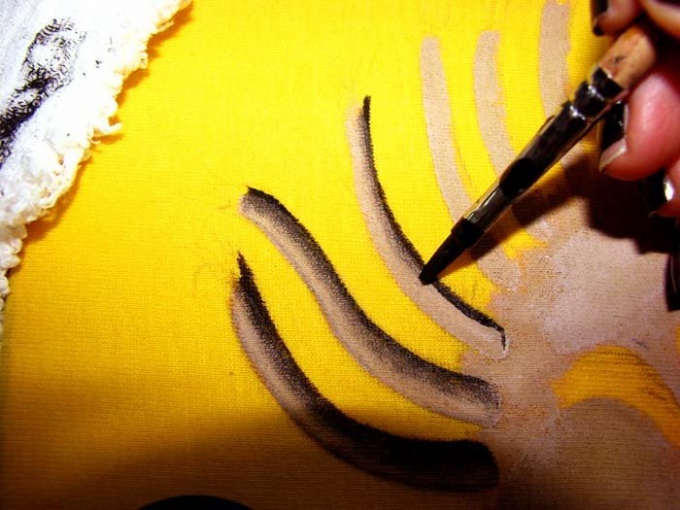 Apply it with a brush of bristles with jagged edges, and the pattern is difficult to be distinguished from oil painting. Apply on wet paper in a few colours around, and then quickly connect all the rows of clean wet brush and they will mix, Recalling the watercolour. To complete the picture, you can use markers, gel and ballpoint pens and even coloured pencils on top of the dried acrylic. Dried acrylic paint is very difficult to wash off. During operation, keep the brush in water, and after finished drawing, carefully rinse them with water. Dilute acrylic paint with water or acrylic binder. When diluted with water the durability of the paint is reduced. To secure the picture it is possible (but not required) to use acrylic varnish with a matte or gloss effect. Acrylic paint has firmly occupied a leading place among the artistic tools used in the crafts and applied arts, due to its brightness, water resistance, quick drying and ease of application. With acrylic paints you can draw not only on paper but also on fabric, on wood, on plastic, glass, ceramics and many other surfaces. This makes acrylic a versatile art material, and you will soon be convinced that to cope with this material very easily. Buying the acrylic, make sure all the colors belong to one manufacturer to make it easier to mix colors when painting. Unlike gouache, acrylic keychain, dry and crack and requires no water for dilution. Instead of water it is best to use special acrylic thinner. Do not use brushes made of bristle, suitable for oil colors – purchase high-quality synthetic brushes of different diameters and cross-sections. Do not forget be sure to rinse in water, brush immediately after the necessary smears will be done – acrylic dries very quickly, and if the paint dries on the brush, wash it will not succeed. 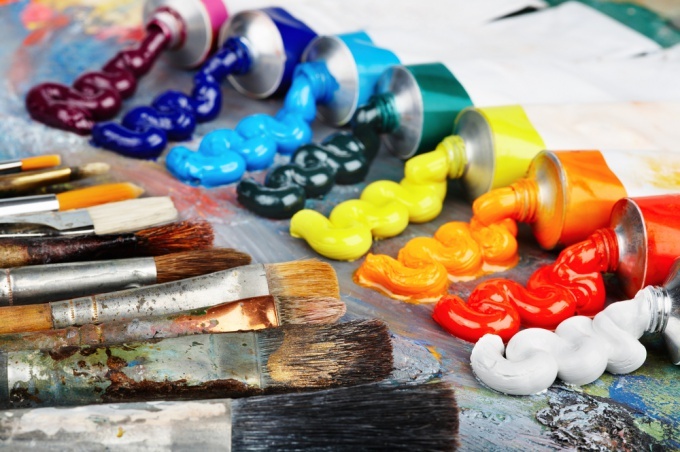 Depending on what you are going to paint, buy in the art store the appropriate colours for painting ceramics, wood, glass, or for ordinary painting on primed canvas or paper. Acrylic paints are ideal for fabric painting. In this respect they are divided into simple acrylic and fabric paint for batik – they are suitable for lighter and airy fabrics (silk or chiffon), and have the liquid structure. If you are going to paint a shirt or t-shirt – buy ordinary acrylic paint for painting textile. They are quite thick, perfect hold on the fabric and are resistant to light and water. Applying the color, do light and thin smears, putting them through short periods of time with each other, the layers of paint had time to dry. It will reinforce the pattern better than if you have applied thick layer of paint. If you decide to paint t-shirt – you'll need a plain t-shirt, preferably made of natural fabric, and also a sketch of the future drawing and paint of the appropriate colors. You can also use acrylic contours, which are sold in tubes and fix the edges of the paint and also serve as an aesthetic decoration and addition pattern. Draw in a spacious room with ventilation. Stretch the shirt on the frame, inserted inside, and cover the inside of the frame with paper or cloth to the paint has not penetrated to the opposite side of the shirt. You can paint with a brush, using a stencil and acrylic spray paints. In the latter case, pay special attention to the respiratory protection. If you draw with a brush, for a start mark on the fabric the outline of the picture with a pencil, referring to the sketch. Then begin to trace them with acrylic contours and complete each element of the drawing color. Detail drawing, modify it, and when you're done – leave it on for a couple of hours to dry. When the drawing is dry, iron it with a hot iron through several layers of paper. To paint with oil paints is not easy. For this you need to prepare the canvas, brushes, handy tools. Paint is applied with different strokes depending on the shape drawing objects and light and shade on them. Label on canvas for future drawing using simple shapes and contour lines. Use this diluted paint, charcoal, pencil. Spherical and toroidal objects draw sickle and twisted brush strokes, confusedly — triangular strokes, cylindrical, parallel strokes. Flat surface print with parallel brush strokes. For smooth color transitions, use the flat brush. In this case, the paint mix on the palette and apply to the proposed location of gradation. Move the brush forward-back-forward in a cross manner. In the final step of creating the color transition use parallel strokes. Work with a clean brush from a darker color to a medium tone, and then clean again with a brush from a lighter color to the middle color. Poziruuschie transparent layers of oil paint, the shading pattern on the dried layer. To get them, use to dilute the paint a special liquid, and the mixture was applied with kolinsky brush in a horizontal position. If you want to change the color of the pattern in the glaze make the direction of the strokes in much the same way that there are on the primary layer. 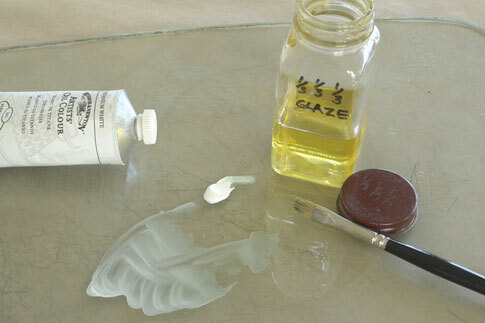 Translucent glazing layers also apply kolinsky brush in a horizontal position. The paint is dilute in the ratio damanskogo 1/3 varnish, 1/3 turps and 1/3 linseed oil. Pencil for outline drawing use with care, as its sharp tip can damage the primer of the canvas. Mix paint on the palette carefully and gradually. For more bright colors, use white color or glaze. 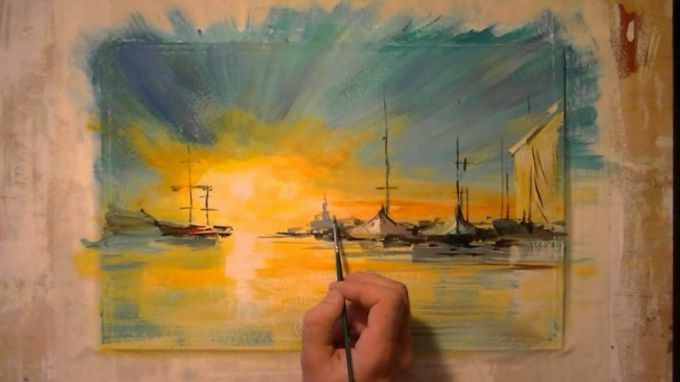 Oil painting is one of the most common techniques for drawing pictures. Oil paints provide painting durability. Color over time do not deteriorate, and the technique provides opportunities and at the same time isn't overly complex, which allows her to learn quickly. For drawing you will need stretched on a canvas stretcher or other surface suitable for painting with oil paints. Also used cardboard or canvas mounted on cardboard. All surfaces must be primed. If you are just beginning to paint with oil, it is better to buy ready primed canvas in the store. An easel is a device that raises the subframe with the picture. Without an easel to draw extremely uncomfortable. Also you and other useful tools, including a palette knife – a special spatula, which is convenient to mix the paint. There is even a technique of painting with palette knife. Brush – usually young artists become the brush of stiff bristles, but also useful and a soft brush. You can draw almost anything, the main thing - do not do this with your fingers because the paint and substances contained in their composition are very toxic. They can penetrate through the skin into the body and cause poisoning. Before you begin writing oil, mix paint to desired shade on the palette. This will help the spatula. To clear brush on paint, use a solvent and cloth. It is best to shade mixing no more than three colors. The traditional material palette – wood, but the glass is also great because it does not absorb paint and will not react with them. As a solvent turpentine is often used, but it is quite toxic. Today there are less toxic solvents with more pleasant odors, pleasant to use them. After you have finished writing, the brush should be rinsed in solvent and then wash in warm water using soap or shampoo. Brush is recommended not to put in the box, and keep the Cup so they could dry. It is best to install in a container of solvent for cleaning brushes additional the bottom with holes. So the paint chips will settle on the bottom without interfering with the rinse of the brush, and the lifetime of the solvent can be substantially extended. The painting process of the individual. Everyone uses their own techniques and tricks. Of course, drawing skills will be useful to anyone who decided to engage in oil painting. Usually before you start the main drawing canvas underpainting is applied. It outlines who write very dilute paint. They are practically invisible. Then begins drawing itself. Oil paint is applied in layers over time, more working through the details. When the painting is finished and has dried, it is coated with lacquer. Usually waiting about a year to paint completely dry. Lacquer coating helps to protect the paint on the painting from shedding and interaction with air. So, the picture is stored much longer.